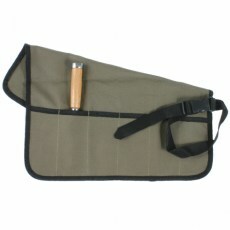 Heavy Duty Cotton Shaped Tool Roll Useful for toting a wide variety of tools up to 240mm in overall length. 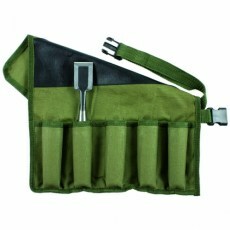 Heavy fabric with shaped pockets for chisels, gouges, screwdrivers, spanners, pliers etc. Includes belt with snap fastener. 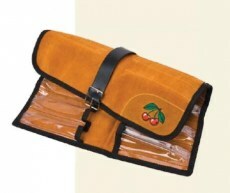 Single Sided Tool Roll Strong, heavilly stitched, impregnated cotton fabric fitted with a belt with snap fastener. As the tools can only be inserted from one side, and are secured by a flap, they cannot fall out. 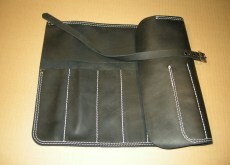 Leather Tool Roll with Offset Opposed Pockets Made for chisels and gouges using fine quality leather. The seams are reinforced with rivets. Soft leather with sopple plastic handle sleeves. Kirschen 2 Cherries Stitched Logo. 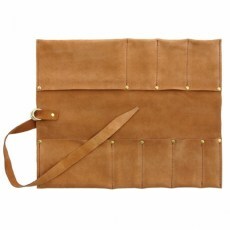 Has two opposed rows of 6 offset, equal pouches and leather strap & plated buckle. 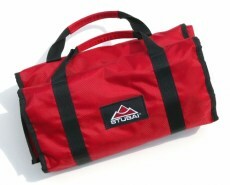 Stubai Tool Roll Canvas roll with two offset rows of 10 pockets and generous flaps. Note: Tool roll only, tools are for illustration of this quality tool roll. 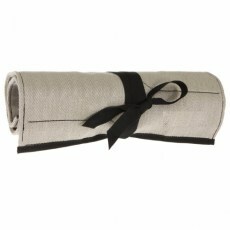 Tool Roll These tool rolls are linen which is lined with a soft grey felt which provides ideal protection for tools. Swiss made.